Posted on January 10, 2019 at 10:14 am. William Isaac Tasker and Henry Asher Mabbott were friends born in Lincolnshire in the late 1800s. 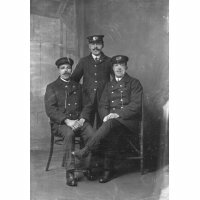 They moved to Doncaster to work as Porters on the railway. Porters helped passengers on the platforms and loaded the train carriages. They were exempt from military service. By 1918 William and Henry were living together at 42 Prospect Place in Hyde Park. They were both members of the National Union of Railwaymen. Henry sadly died in 1918, but better news followed as William married Henry’s sister, Rose Mabbott, later that year. They had a son in 1920. By 1939 they had moved to 76 Harrowden Road in Wheatley, and William still worked on the railway as an LNER Guard. The third man in this photograph is called Mr Johnson. We are unsure of his background, but he seems to be a good friend of William and Henry. The GNR Society are building a database of GNR employees so I was delighted to see this photo and article. Henry was born in 1886 in the intriguingly named hamlet of Woodnook, just outside Grantham, and moved to Doncaster to work for the GNR sometime between 1911 and 20 September 1913 when he joined the NUR. William was born in South Kyme, near Sleaford in 1892 but I have not been able to trace him in the 1911 census. He also joined the GNR in 1913 – the LNER Staff Return of 31 October 1939 gives a start date of 16 June 1913. I have added both to our databases. Do you know which is which on the photograph? As for military service in WW1, I have not found any record that Henry & William served in the military forces. At the outset of war many railwaymen volunteered, so much so that the railway companies, with government support, were able to introduce ‘protected occupations’ which covered many of the jobs done on the railway. 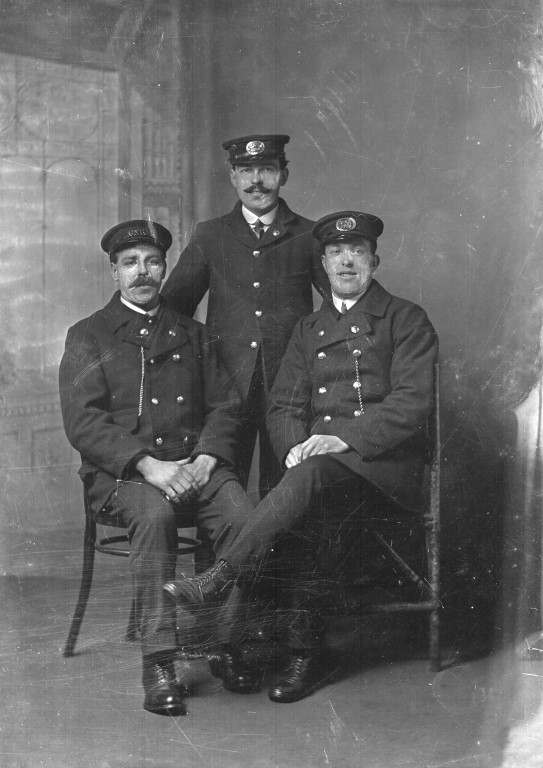 However, this did not stop railwaymen continuing to join the forces – a number of young men employed at the Doncaster Engineering Works simply resigned (or left without notice) and volunteered. In my database of GNR employees who lost their lives in the conflict, I have found nearly 160 porters who lost their lives in the conflict, including at least two from Doncaster. When conscription was brought in, men who had been in ‘protected occupations’ were not necessarily exempted, and many more railway workers were called up for service, now being replaced, albeit temporarily, by women. It appears, however, that Henry & William did manage to see the war out at home. On your database heading for William and Henry, you have put “Regiment – NER Railway”, referring I assume to the North Eastern Railway. It should read “Great Northern Railway”.